You may want to add some info to your article about the ACI. When using it at longer distances you need to put the lazered distance as well as the cosine into a software package such as Exbal. You will find that if you just multiply the cosine x lazered distance you will get a different answer than by putting all of the data in Exbal. This has been proven to be true by shooting at longer ranges using both methods. One more thing to add to this article. Be very careful whey you “ZERO” the unit to your rifle bore. If you tighten the shroud screw too tight, the unit will bind and will not function properly. Unless Waren has not fixed this problem, you can fix it yourself by removing the two teflon washers inside the unit. I’m sure Waren would not like this idea, but it’s the only fix to this problem. Good luck! 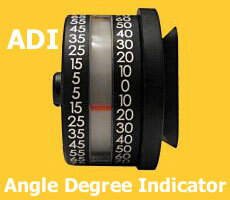 There are three different methods of utilizing the Angle Cosine Indicator and one is more accurate the other. METHOD #1: The original method and least accurate is called the “Rifleman” method. This is where the shooter multiplies the sloped distance to target by the cosine number. Then obtains the corrected for gravity hold from their data card. Method #2: This is the “Improved Rifleman” method. This is where the shooter multiplies the cosine number directly to the hold as depicted on their data card. As an example, if you are shooting a .300 Win Mag at a distance of 600 meters, (Where I live the elevation is 8000 feet ASL) my hold as depicted on my data card equals 3.6 mils. If I am aiming at a Big Horn Sheep at 600 meters and I am aiming up on a 45 degree angle, (Cosine .7) I would multiply .7 X 3.6 mils = 2.52 mils. My corrected for gravity hold is now 2.5 mils. a. The bullet‘s time of flight is, [for all intents and purposes], the same to the target. b. The bullet’s own unique ballistic coefficient. c.	The bullet’s own unique velocity. d.	The bullet’s own unique deceleration curve. e.	The commingling of the meteorological data of the area that you are shooting. 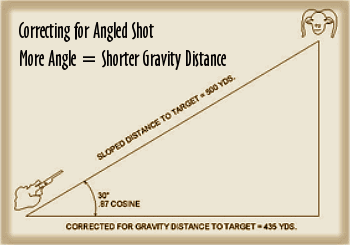 One minute of angle equals 1.047 inches per hundred yards. At 800 yards, that would equal 67”. 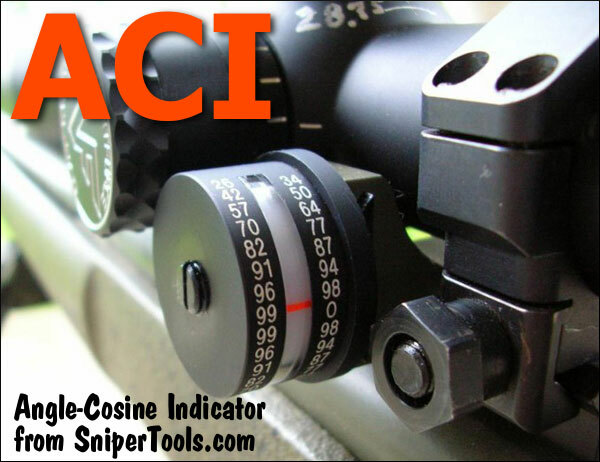 As far as over tightening the ACI, I strongly suggest reading and following the instructions that are included with each ACI purchased. ONLY tighten the shoulder screw to five inch pounds of pressure. Scope rings should not be tightened any more than 15 inch pounds of pressure MAX, with 12 inch pounds of pressure recommended. Why would I want something like this when laser range finders are readily available with angle finding/compensating capability built right in? I think this a great tool but i’m cheap so I’ll stick to the mil-dot master I’m not in that big of a hurry.